The .44 inch Smith & Wesson "Russian" revolver was designed in response to a series of huge orders from the Russian government which commenced in 1871. It was based on an existing S&W design, but incorporated improvements suggested by the Russians; particularly with regard to the ammunition it chambered. These modifications resulted in the standard issue Model 1874 revolver. 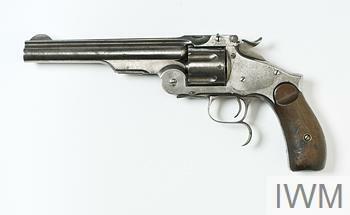 Identical revolvers were produced for the commercial market as the 'New Model Russian'. Smith & Wesson's production alone could not meet the demands of the Russian Army and manufacture was carried out under license at the Tula Arsenal in Russia and by the German arms producer Ludwig Loewe & Cie. 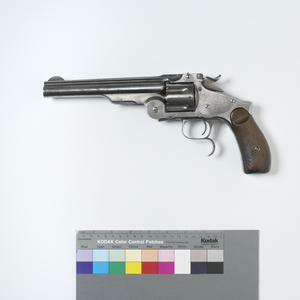 This revolver was produced by the latter company. Although superseded by a 7.62mm revolver from 1895, the Model 1874 revolver could still be found in Russian military service during the First World War.